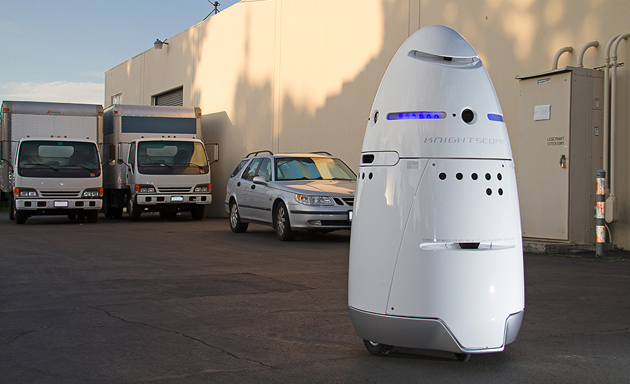 It has been confirmed that a man in Mountain View, California, was recently arrested for assaulting a robot. The bot in question, a K5 automated security device, was ambling around a car park when the man drunkenly tipped it over. Which is no mean feat; the thing weighs 300lbs! However, the police aren't overly concerned about the robot's feelings, and more with the fact that the man, Jason Sylvain, was publicly drunk and causing a nuisance. 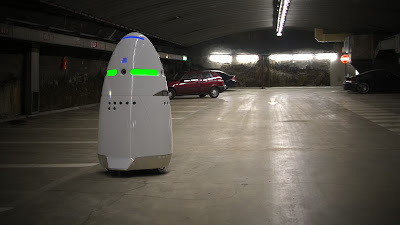 Still, the K5 robot, which is used to patrol car parks and warehouses using cameras and sensors to detect intruders, reacted exactly as it should have, recording the incident and blaring an alarm. In fact, the robot's creators, a company called Knightscope, are keen to learn how the man manged to tip the robot, and hope to make improvements to their design. To be fair to the bloke, if you were drunk and this thing rolled up to you, you'd be pretty alarmed too, right?